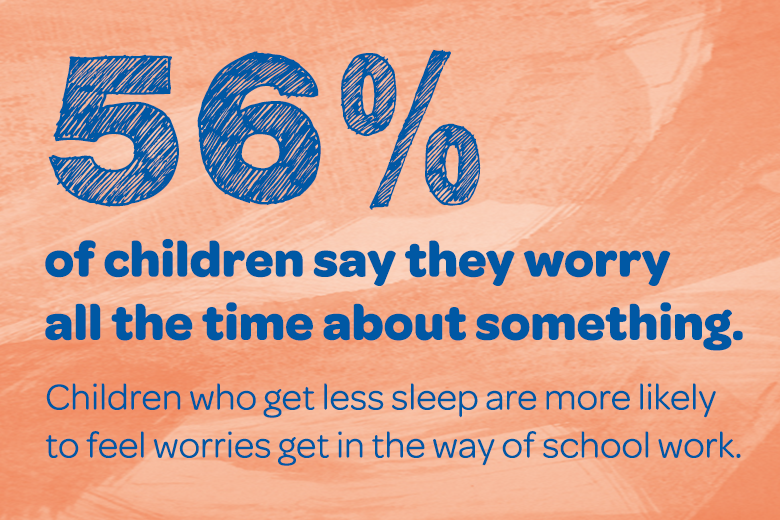 New research released by Place2Be for Children’s Mental Health Week 2019 (4-10 February) suggests that children with less sleep are more likely to struggle with worries. Children and young people who usually get less than the recommended 9 hours sleep on a school night are more likely to feel that worries get in the way of school work (32% vs 22%), according to a survey of over 1,100 10-11 year-olds and 13-15 year-olds carried out by Place2Be. More than half (56%) of children and young people say they worry “all the time” about at least one thing to do with their school life, home life or themselves – and those getting less sleep are less able to cope with worries, saying they often don’t know what to do when they’re worried (22% vs 18%), and once they start worrying, they cannot stop (36% vs 28%). For Children’s Mental Health Week 2019 (4-10 February), Place2Be is taking steps to be ‘Healthy: Inside and Out’. Because our bodies and minds are very closely linked, simple things that we do to improve our physical wellbeing – like eating, being active and sleeping – can help our mental wellbeing as well. Back in November, Place2Be released free resources, including assembly plans, slides, group activities and top tips to help schools and youth groups explore these different ways of looking after their bodies and minds.